UK Customs Regulations - Bringing Foods to the UK? UK Customs - What Foods Can You Bring Into the UK? When it comes to food and agricultural products, what you can - or cannot - bring into the UK, isn't a mystery anymore. Duty free allowances for bringing gifts of alcohol, cigarettes and perfumes are widely publicized. But what about food products, agricultural produce, plant materials? They often fall into a grey area of difficult to understand regulations. Judging from the number of UK customs questions we get from readers - especially as holidays approach and people want to bring gifts to friends and family - there's still a lot of confusion about it. But thankfully, that should all change now that the UK government has published quite a lot of information and clarification online. Best of all, they've also published an online tool that you can very easily search. The UK government's web page, Bringing food, animals or plants into the UK, is a way to quickly check products you are thinking about bringing into the UK. But for a more detailed look, use the Personal Import Rules Database. This comprehensive tool provides detailed information, by country, on hundreds of food products (including animal products) you might bring into the UK in your luggage, or send there by ordering online. The database also has information on weight limits. If you bring back honey from most places, for example, it will count as part of a 2 kilos (about four lbs) per person total allowance in combination with other food products. On the list - live bivalves, eggs and egg products, skinned frogs legs, reptile, insect and snail meat (yum). So if you can bear to leave the clams, boiled rattlesnake and chocolate covered ants behind, you could, in theory, bring in 2 kilos of honey. And you can bring a 20 kilos (that's about 40 lbs) combination of fish and fishery products (from most places) that can include live lobsters. How you are supposed to keep 40lbs of live Maine lobster alive on a transatlantic flight is a good question - but I'm sure someone has the answer. At the moment, the rules and regulations described in this article are for bringing food to the UK from outside the EU. Basically, you can bring any food product you like, including meat and dairy products, from countries within the EU. How Brexit might change that is anybody's guess as of October 2018. But with Britain's full EU exit less than six months away, the this could be the last holiday season for bringing unrestricted amounts of food and drink in from Europe. 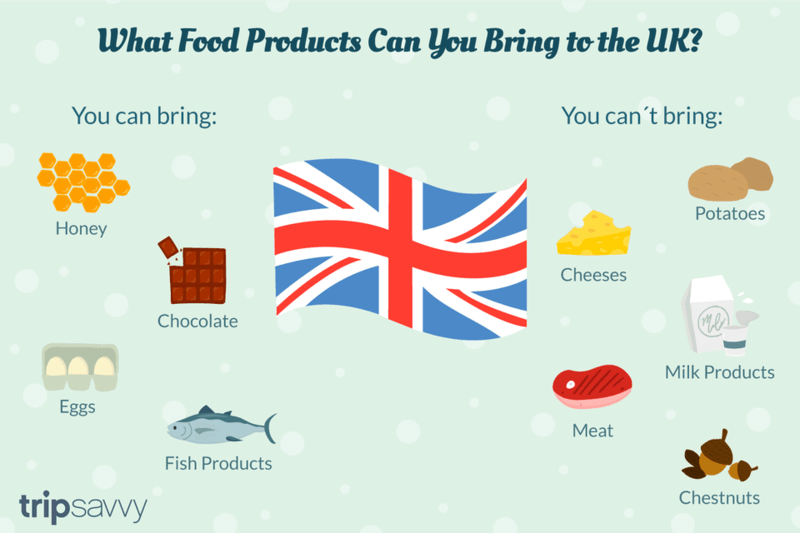 Don't even think about bringing meat, potatoes or cheeses to the UK from outside the EU. Milk products from outside the EU are banned - so no powdered milk drinks from Australia or that nice hunk of Wisconsin Cheddar you were planning to bring Great Aunt Felicity. And potatoes or potato products from anywhere (including the EU), even canned, bottled or otherwise packaged, are strictly forbidden. It you are served a bag of potato chips on the plane, eat them before you land or leave them on the plane. Those restrictions apply to canned and packaged products as well. So no canned corned beef hash or devilled ham from outside the EU, no potato chips or tins of matchstick potatoes. There are some surprising restrictions. While you can bring in allowed quantities of most fruits and vegetables from the USA, you cannot bring chestnuts. Only chestnuts from the EU and European Mediterranean countries are allowed. So if granny makes delicious chestnut spread for the holidays, leave it home. On the other hand, if she bakes a mean batch of chocolate chip cookies with chopped pecans baked into them, by all means, bring them along. To find out what you can or cannot bring, just follow the instructions on the Personal Import Rules, DEFRA website. Type in the country you are coming to the UK from or where the goods you are bringing have come from.Then use the search categories to narrow down the food category and find the actual product. Once you've found what you are looking for, click the button and the information - including weight limits - pops on screen. Remember, this is a "personal imports" database. The allowances are calculated for your own private use. Some food products that are allowed but not weight restricted - bagels from New York, chocolates from Paris - are limited by what customs officials think are reasonable quantities. They can use their discretion about that but if you are bringing in very large amounts - that could be for resale - your products could be subject to health checks and other commercial regulations. Only one herb commonly available in some countries is specifically banned by UK authorities and that is Kava Kava. The ban, tightened in 2015, is because the herbal remedy, sometimes used to combat stress, has the potential to cause liver damage. The picture is less clear for other herbs and spices. In fact, it is something of a minefield and probably best left to the professionals who can seek advice from the Seasoning and Spice Association. There are no specific laws or standards that apply and, if they are dried and packaged, there is usually no objection. But, individual ingredients, additives or packaging methods may involve health restrictions or food restrictions. You can find some trade rules about herbs and spices at the Food Standards Agency.